1&2. A few weeks ago I placed an order with our Avon lady, I'd forgotten about it until it turned up this week. I ordered 'Pout' lipstick (which looks nothing like the photo in the magazine but I really like it), a natural tones eye shadow palette and a spray that claims to speed up nail polish drying time, I've yet to try it out. It was amusing that the pallette had some similar colours to the Urban Decay palette I got this week, it's staying power is pretty rubbish though. 3. This pallette is worth the rave reviews it's been getting all over the blogging world, it's been sold out for a while online but the Debenhams in Cardiff had a mountain of them earlier this week. 4. Pout, my new favourite lipstick. 5. 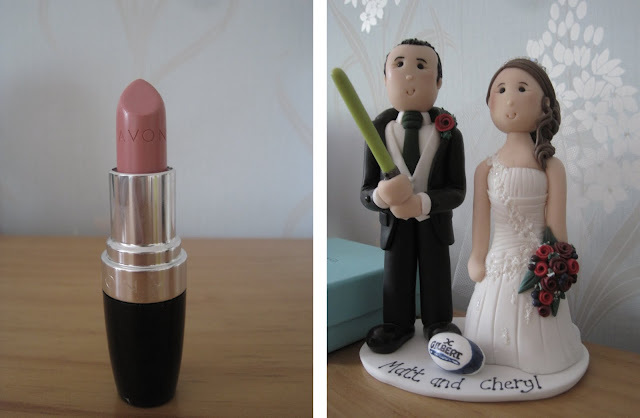 Our wedding cake topper, the mini me is a fairly spot on version of what I looked like. This week I've been thinking of doing a cherish the dress shoot, my dress is still under my bed as I can't stand to be parted from it. 6. Matt and I are planning a trip to the USA in autumn, Matt's never been to either city despite being American. I went to NYC back in 2008 and I would really love to go back. We're planning on staying at the hotel I stayed at back when I went, I don't give the name out to many people though as I don't want the whole world knowing about it. 7. On 1 July Matt and I along with my parents are going to watch A Midsummer's Night Dream in Cardiff Castle, my birthday is a couple of days later so we're using it as an early birthday treat meaning there will be a fancy picnic and lots of champagne. 8. My lovely top from Tesco, I've had it for a couple of weeks but I've only been able to wear it this week as I finally got a new pair of skinny jeans (I don't do leggings). 9. Today has revolved around going to PC World to find me a new laptop, my not even three year old Dell has died but in order to save money I'm going to get a netbook instead of a laptop. We stopped into Waitrose on the way home where I treated myself to a cupcake, the photo shows the iced flower that was on top. I can never bring myself to eat that bit. 10. I've just finished chowing down on a lovely lamb balti from Empire, probably one of the best Indian restaurants in Cardiff. Aw I love the wedding topper. Is that a light sabre? Have you tried Mowgli on Crwys Rd for Indian? I love Empire but they are pretty good too.